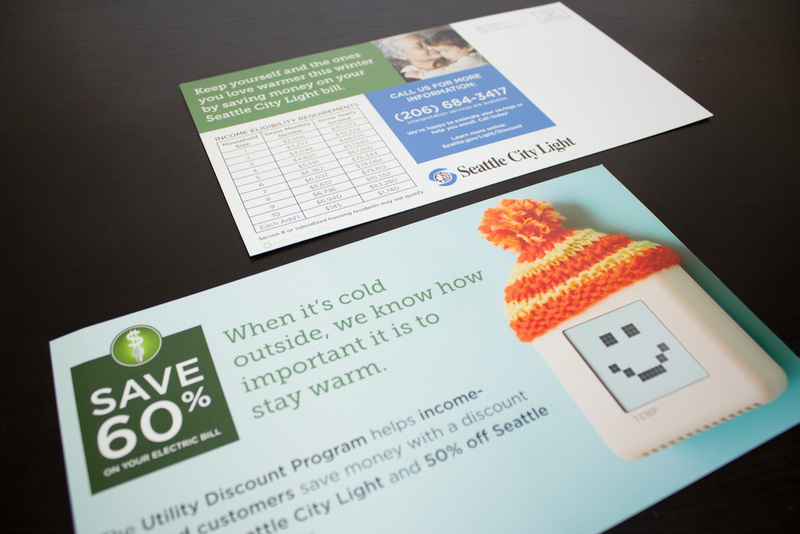 Trio NAE developed an outreach campaign to promote Seattle City Light's Utility Discount Program. Seattle City Light offers one of the most generous rate discount programs in the nation to income-qualified customers. The Utility Discount Program (UDP) is a major priority of the Seattle City Council and City Light leadership. Support Seattle City Light’s 2013 goal of 15,000 rate payers enrolled in the Utility Discount Program through a targeted messaging and outreach program. Develop a cohesive brand identity for the program to be implemented throughout all materials. Our first step was to review Seattle City Light’s outreach efforts for the Utility Discount Program during the first three quarters of 2013. We worked with key staff to identify their target audiences, and discussed the channels best suited to reaching each segment. The resulting strategy called for simpler, more friendly language that clearly communicated the benefits of the program while remaining culturally sensitive and easy to understand for non-native English speakers. 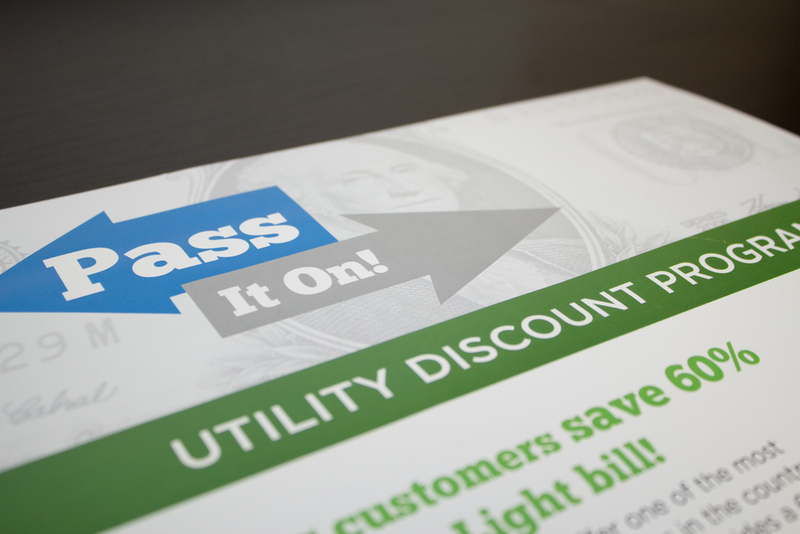 We also developed an internal-facing “Pass It On” campaign to help City Light employees communicate the value of the Utility Discount Program. We designed a print-based outreach campaign delivered through a wide variety of channels including nonprofit housing partners, community groups, other need-based government assistance programs, and touch points such as bus interior signage and utility bill inserts. 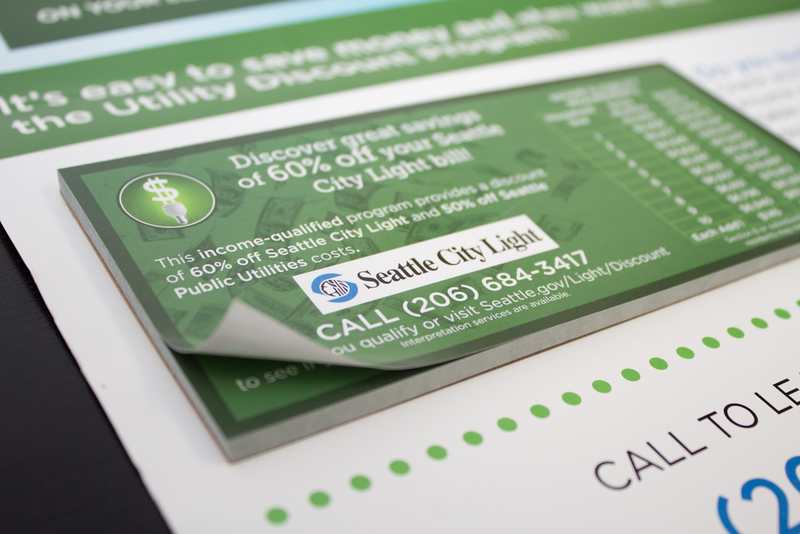 Keeping in line with Seattle City Light’s sustainability goals, we printed each piece on post-consumer recycled product. Seattle City Light asked us to manage distribution including direct mail, based on our long history of printing and mailing statements for the utility. Since its launch, the campaign has seen impressive results, including a 125% increase in applications received for the program. Additionally, the UDP application accounts for over 25% of all download events on the Seattle City Light website, which has seen an overall increase in visitors. The cohesive, recognizable identity system and consistent messaging has also improved market awareness of the program, as evidenced at neighborhood events throughout Seattle, setting the stage for an even more robust outreach program in 2014.